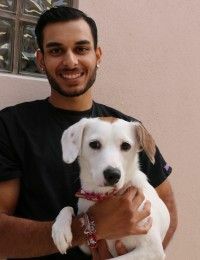 Rikhil is a UCF student in his senior year, majoring in Biology with a Pre-Veterinary track. After graduation he plans on going to Veterinary school, and hopes to become a Zoo Veterinarian. In his spare time he likes playing football and soccer, going to the gym, playing video games, and hanging out with friends and family. At home Rikhil has one dog, a Siberian Husky/Wolf mix named Blizzard, and 2 bearded dragons!